Think again. Juvederm treatments, and wrinkle treatment with other popular cosmetic fillers such as Radiesse, are some of the easiest and most immediate ways to eliminate unwelcome wrinkles, such as “smoker’s lines” and smile lines around the mouth. These same therapies can also fill in acne scars, better define lip borders and restore volume to lips that have thinned with age. 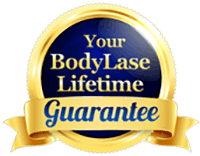 BodyLase® offers the latest in cosmetic fillers, such as Juvederm and Restylane (hyaluronic acid fillers), as well as Radiesse, which actually stimulates your own natural collagen production. BodyLase® only uses these natural, purified forms of fillers. Young, healthy-looking skin contains an abundance of a naturally hydrating substances called collagen and hyaluronic acid. As you age, lifestyle, sun exposure, simple genetics and other factors can reduce the amount of collagen and HA in your skin. The lack of natural components causes your skin to lose structure and volume – creating unwanted facial wrinkles and folds, like those parentheses lines around your nose and mouth. Over time, your body will absorb these substances and your skin will eventually return to its natural state. Although people absorb these fillers at different rates, you can expect Juvederm and Restylane to last for 9-12 months and Radiesse to last for up to a year or more. Touch up treatments will help maintain your results on a permanent basis. Juvederm helps replace the hyaluronic acid (HA) your skin has lost, adding volume to smooth away facial wrinkles and folds. Juvederm’s main ingredient, Hylacross, helps it hold up over time. Juvederm is the first smooth-consistency HA gel and the only HA filler that’s FDA approved to last up to 1 year with only 1 treatment. Iconic beauties like Brigitte Bardot and Marilyn Monroe knew that the secret of a sultry look was in the perfect pout! Lucky for you getting the perfect lip is sweet and simple. The pay-off, however, is invaluable. Find out how to make the most of what you’ve got and finally get that heartbreakingly gorgeous kisser! Want natural-looking fullness that you can simply wake up with? Don’t wait any longer. Already endowed with kissable lips? Refine your smile with some definition along the edges. Radiesse, a filler comprised of calcium-based microspheres and gel, immediately smooths out fine lines and indentations. Radiesse not only delivers immediate results, but also encourages collagen production for long-term correction of up to a year. “The staff are professional and welcoming. My nurse is an artist with fillers and Botox®. I trust her completely. You can tell she loves what she does and is highly trained. I would not go anywhere else. Thanks for always delivering such positive results.” ~ Sheila C.